Puke n Vomit Records of Fullerton California has released a 10-song, full length LP titled "Chasing the Monsters" (the title track song written by Larry Seaman of the Standing Waves). This marks the second Makeups release on Puke N Vomit Records. In 2010, the label released a 4-song ep. Click BELOW to order vinyl by credit card or PayPal. Zerox recorded at Earth & Sky Studios, Austin, TX 1981. 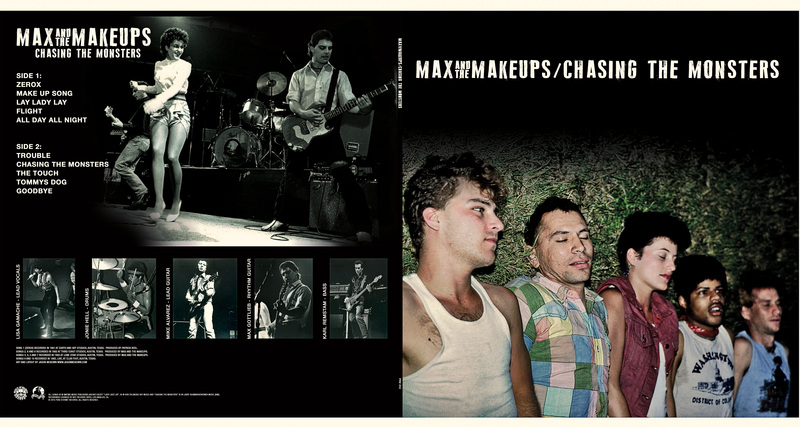 The Makeup Song, Trouble and The Touch recorded at Third Coast Sound, Austin, TX 1982. All Day All Night, Chasing the Monsters, Flight and Lay Lady Lay recorded at Lone Star Studios, Austin, TX 1984. Tommy's Dog and Goodbye recorded live Club Foot, Austin, TX 1983. Licensed From Not Records Tapes. Gatefold gig flyer collage insert included. All songs produced by Max And The Makeups (ASCAP) except for "Zerox", produced by Patrick Keel. All songs © Copyright MNTMU Music except "Chasing the Monsters" (Larry Seaman/Herkemer Music) and "Lay Lady Lay" (Bob Dylan/Big Sky Music).